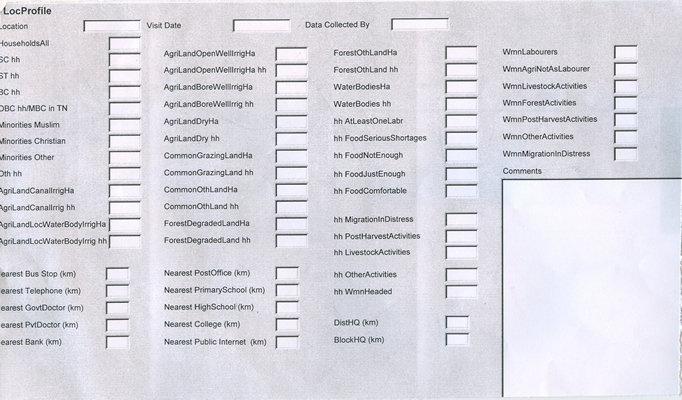 We initiated detailed information collection from randomly selected villages from one block each from each selected district. For the purpose of data collection, 28-45 habitations were randomly selected. The purpose was to landscape the local situation in terms of customer profile (Natural resource base, dependence on agriculture, livelihoods), support and service networks, and opportunities that could be further explored for relevant interventions design. In the process of understanding the household livelihood status, we collected information on the food security status and the main source of income for their livelihood. The details of activities that women are specifically engaged in and the constraints faced by them during the course of their work were collected.. It was also relevant to collect information on the constraints faced by women in undertaking the activities to determine the type of support that would be required to overcome these constraints. Information on village infrastructure at these locations is critical for evaluating potential interventions and therefore collection of this information is very important. So information on infrastructure such as electricity, transport, credit, marketing and communications were collected. Three sets of group discussions interviews with men and women were held in each village to generate the information and the approximation from this data was compiled into MS-Access. This exercise was carried out to make the database more accurate and valid. There were also provisions in the database to incorporate general comments by the field investigator. 8. What are the roles of men and women in Agriculture, Livestock, Forest Based Activities, fisheries, post harvest activities and other household activities? 9. What are the prevailing Wage rates for men and Women in their village and their respective hours of work? 11. Are there any local institutions existing in the Village/Habitation like SHGs/CIGs/Co-operatives/Federations?